Picture shows part of the S.I.D International delegation, including Rolf Fuhrmann (Centre middle row) visiting Alfred Schütte GMBH Facility in the Sauerland region. 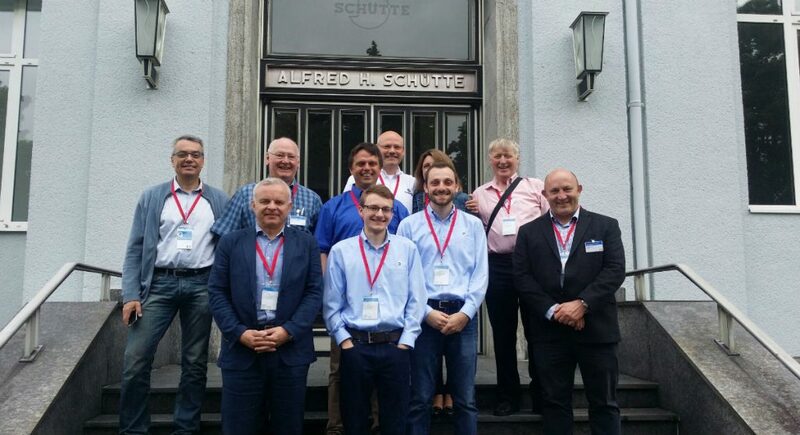 Managing Director of Mann Engineering, Rolf Fuhrmann is attending the S.I.D Conference 2016 in Cologne Germany this week (19th – 23rd June) as part of the PTMA (Precision Turned Parts Manufacturing Association) Ireland delegation. S.I.D. stands for Syndicat International du Décolletage. This international organization was created in 1963 to bring together national organisations representing the machining industry. Seven countries are currently members: Germany, Spain, France, Ireland, Sweden, Switzerland and the USA. The chairmanship, currently held by Switzerland, rotates every two years. The PTMA is the Irish arm of S.I.D which represents the precision turned parts industry here in Ireland. Mann Engineering are members of the PTMA and Rolf has been a member of the PTMA executive for a number of years. It is important from our point of view to stay abreast of what is happening in the precision turning industry worldwide and this conference gives us that opportunity. We learn from our colleagues in other countries, whether that is in relation to new technological advances in Lathe and machining technology, what affect 3D Printing and additive technology will have on our industry, or for example learning more about the CNC machining training program which starts in Secondary schools in Sweden or the advancement of apprenticeship programs in Germany, plus the company visits allow us to benchmark ourselves against what is seen as the best in class worldwide, when it comes to CNC machining. The conference is divided into two parts, the first of which is the congress meeting, which will comprise of Presentations and discussions, on Machines and Tools, Materials and Supplies, Customers and Competition, Management and Staff, Material Costs and Business Conditions and also Economic and Association Reports by the different Countries. The second part of the conference comprises of visits to local precision machining facilities. These visits are taking place in The Bergisches Land (Country of Berg or Land of Berg) and the Sauerland, which are two regions within the state of North Rhine-Westphalia, where many small and medium sized metal working companies – most of them family run similar to Mann Engineering– who have built up their businesses (turned parts, locks and fittings, tools, automotive parts, etc.) for generations. The companies being visited are Alfred Schütte, Hugo Karrenberg, Robert Schröder in the Sauerland region and Julius Klinke, and Wilhelm Schauerte in the Bergisches Land region. Cologne is Germany’s fourth largest city (after Berlin, Hamburg and Munich), and is the largest city both in the German Federal State of North Rhine Westphalia and within the Rhine-Ruhr Metropolitan Area, one of the major European metropolitan areas with more than ten million inhabitants. headquarters of the military in the region. Cologne is a major cultural center for the Rhineland. It is home to more than thirty museums and hundreds of galleries. Exhibitions range from local ancient Roman archaeological sites to contemporary graphics and sculpture.